Like a Newfoundland Ghost town, the small cove was dotted with fishing boats moored to shaky docks. Paint of many of the aging boat sheds had lost the battle against the abuses of wind and water. If anyone belonged to the few cars scattered about, they were hidden behind walls and closed doors. I felt like an intruder as I stopped my little Subaru by the water's edge and pulled Arayo from the car. Should anyone be watching, I hoped that the presence of a Newfoundland Dog would help establish a bond of commonality. "I have a Newfy. I come in Peace." Unsure if I would be welcome beyond the road's edge, I stood beside the car and captured a couple of quick images when an old man came walking down the road. Bundled against the wind in a down jacket, he sported a week's worth of beard and carried a wrapped plate of lunch. 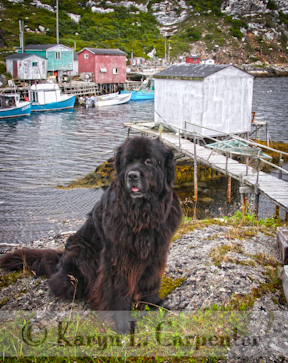 Explaining that I'd brought my Newfoundland back to visit her roots, I begged permission to venture closer to the water and the picturesque sheds. "Help yourself, dear," he replied. He shared that about 70 families lived in his little town of Diamond Cove. Most, like him, were fishermen, though his days on the water were past. "I'm 76. Retired now." "Fishing seems like it would be a hard way to make a living," I commented. "No, there is no better way," he replied, and encouraged me again to make myself at home in his little piece of the world. As he headed up the hill and out of sight, I was left to explore, while the wind kept me company. Let me know the areas I don't want to miss, Gloria! It looks like rough terrain, and I am sure the winters must be harsh. I hope you are meeting locals and gathering tales. Red Head Cove at the top of Conception Bay is amazing!!! Drive up the coastline of Trinity Bay to see some great views. I'm just loving the photographs! !